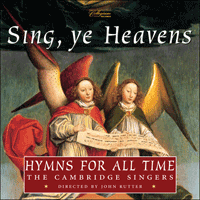 Sing, ye Heavens is an inspiring album of 21 hymns spanning fifteen centuries of the history of Christian Europe, and including the world première of a new hymn by John Rutter himself, Eternal God. Reflecting the immense riches of hymnody built up over centuries, this notably eclectic survey sees Gregorian Chant rubbing shoulders with German chorales, Celtic folk melodies alongside 18th-century London street songs—albeit from an Anglican perspective. The arrangements range from delicate accompaniment of the harp to thrilling festival treatments with brass, timpani, percussion and organ. Hymn-singing being a direct descendant of psalm-singing, it is not surprising that so many hymn texts are based on the psalms. The three examples here are among the finest and best-known. Isaac Watts, who wrote O God, our help in ages past and over a thousand other hymn texts, was a Nonconformist minister in London and later tutor and chaplain to the Abney family of Cheshunt. The hymn was published in his 1719 collection The Psalms of David imitated in the language of the New Testament. The tune is almost certainly by William Croft, chorister and later organist of the Chapel Royal in London, and organist at St. Anne’s Church in Soho (whence the tune takes its name), although no composer is credited in the 1708 collection in which it first appeared. Surprisingly, text and tune do not appear to have been wedded until 1861, in the first edition of Hymns Ancient and Modern. H. W. Baker, the Anglican clergyman who wrote The King of love my shepherd is, was an editor of this significant hymnal, and his much-loved Psalm 23 paraphrase (with its startlingly anachronistic line ‘thy Cross before to guide me’) first appeared in it. The lovely Irish tune St Columba was first put to Baker’s words in The English Hymnal of 1906, just one of many inspired matches made by the hymnal’s music editor, Ralph Vaughan Williams. The melody came from the Petrie Collection of Irish folk tunes, published in 1855; it was doubtless drawn to RVW’s attention by his old composition professor Stanford, who was responsible for the distinctive triplet in the melody which is not there in the original. Martin Luther’s Ein’ feste Burg (he seems to have written the tune as well as the words) was described by Heinrich Heine as ‘the Marseillaise of the Reformation’. Its text, notably belligerent in tone, was inspired by Psalm 46 rather than paraphrased from it, eventually becoming so popular in Protestant countries that over a hundred translations were made. In Britain, Thomas Carlyle’s version (A safe stronghold) is standard, but in the United States the 19th-century version by F. H. Hedge is perhaps the best-known. An impressive array of composers including Bach, Mendelssohn and Meyerbeer have used this hymn in compositions of their own: Bach was possibly the first to iron out the original irregular metre of the hymn into the four-square version sung today. Veni, Creator Spiritus—one of only two hymns to have the honour of inclusion in the 1662 Book of Common Prayer—is among the earliest heard on this album. The words are believed to be the work of Rhabanus Maurus, Archbishop of Mainz in the ninth century, and the tune is probably even older. It is the office hymn for Terce at Pentecost, and has also been used at ordinations since the eleventh century. Lo! He comes with clouds descending invokes the Second Coming rather than the Holy Spirit. The text, published in 1760, is a conflation made by the English evangelical clergyman and editor Martin Madan of two related texts by Charles Wesley and John Cennick. Madan was the first to print the tune, which is of unknown, probably secular English origin, in anything like its present form. Now generally sung at Advent, Lo! He comes remains one of the most sweeping and powerful hymns of its kind. Also one of the great eighteenth-century English evangelical hymns, Love Divine, all loves excelling was inspired by the form and metre of Dryden’s patriotic poem Fairest isle, all isles excelling (set by Purcell). It became associated with the Welsh tune Hyfrydol in the twentieth century. This was composed by R. H. Prichard, a Welsh mill-worker and chapel precentor, and published in 1855. The eucharistic text of Pange lingua gloriosi Corporis mysterium was written in 1263 by the Italian scholar-priest St Thomas Aquinas at the request of the Pope to fit the melody of Pange lingua gloriosi proelium certaminis, Venantius Fortunatus’s famous sixth-century hymn in honour of the Cross. The melody was used by Holst in The Hymn of Jesus and by Charles Wood (to its original text) in his St Mark Passion. The text of Let all mortal flesh keep silence is even earlier in date, taken from the fourth-century Orthodox Liturgy of St James of Jerusalem; Gerard Moultrie’s verse translation was published in 1864 when there was renewed interest in early Christian rites, awakened doubtless by the Oxford Movement. Vaughan Williams included it in The English Hymnal, set to the French carol melody Jésus Christ s’habille en pauvre, an unlikely but inspired union. Vexilla regis has always been one of the most renowned of early hymns, its imperial imagery a vivid reminder of the Christianizing of the Roman empire (a vexilla is the banner at the head of a Roman legion). Reputedly this hymn was written in 569 to welcome a procession bringing a fragment of the ’ true Cross’ to the convent of Poitiers. In contrast to its triumphant tone, Drop, drop, slow tears is a devotional reflection, sung at Passiontide but not specific to that season. Like The King of love and Let all mortal flesh, it was a Vaughan Williams ‘marriage’: in The English Hymnal he joined a poignant text by the Jacobean poet and clergyman Phineas Fletcher to one of Orlando Gibbons’s hymn tunes (Song 46, published in 1623). Interestingly, poet and composer are linked by their connection with King’s College, Cambridge, where Gibbons was a chorister and Fletcher a student. By common consent, When I survey the wondrous Cross is one of the finest hymns to spring from the evangelical movement in eighteenth-century England. The gory imagery of Isaac Watts’ text of 1707 is remote from present-day religious thought (if not from present-day Hollywood films) but was common currency to Protestants of the time: Bach set similarly bloodstained texts to music in his cantatas and Passions without complaint. The tune, an adaptation of a melody called Tunbridge made by Edward Miller, organist of Doncaster Parish Church and a former flautist in Handel’s orchestra, was published in 1790 and soon became the standard one for these words. It was aptly harmonized by the glee composer Samuel Webbe in 1820; his version is sung here for the first verse. The agreeably florid tune of Christ the Lord is risen today has a similarly convoluted history: it was first published, with no composer credited, in an English collection called Lyra Davidica in 1708, but that version is much different from the one sung today, which seems to have finally crystallized, after various intervening alterations, in Hymns Ancient and Modern in 1861. Wesley’s text (originally of 11 stanzas) is finer than the anonymous Jesus Christ is risen today, to which text the tune is more often sung in England. Many hymns are drawn from, or inspired by, the tradition of folk song and/or folk poetry. Be thou my vision is a translation of an eighth-century Irish verse prayer, wedded by the editors of The Church Hymnal (an Irish hymnal of 1919) to the now famous melody Slane, taken from Old Irish Folk Music and Songs, a collection of 1909. The text of All things bright and beautiful is likewise Irish, perhaps the best-known of a number of children’s hymns written by Cecil Frances Alexander, who was born in Derry in 1818. Perhaps disapproving of W. H. Monk’s Victorian tune to which the hymn was originally sung, in 1915 Martin Shaw (friend and collaborator of Vaughan Williams) fitted the text to a sturdy English folk-tune he called Royal Oak, which is the tune sung here. Morning has broken (unexpectedly given a boost to its fortunes by becoming a pop hit in the 1960s) dates back to 1931. While compiling Songs of Praise Percy Dearmer—clergyman, writer, and Vaughan Williams’s co-editor of The English Hymnal and Songs of Praise—asked Eleanor Farjeon, a children’s author, to write a text to fit the old Gaelic melody Bunessan, which came from an 1888 collection called Songs and Hymns of the Gael. The result remains one of the best-loved of children’s hymns. Amazing grace was similarly elevated to prominence by pop versions, the first of them made by Judy Collins in 1970, but both its tune and its text were written long before then. John Newton (1725–1807), the author of the somewhat autobiographical text, had been master of an English slave ship but became an ardent evangelical and abolitionist after coming in contact with Wesley and Whitefield. Following ordination, he was appointed curate of the village of Olney, where he and William Cowper produced their collection Olney Hymns in 1779. The tune (a typically pentatonic shape-note melody) first appeared in an American collection of 1829, Columbian Harmony, and by 1835 was associated with Newton’s text to which it has been wedded ever since. We plough the fields, and scatter can fairly be looked upon as a folk hymn even though the identity of poet and composer are known, because it was deliberately written in folk style. The text, by the German writer and poet Matthias Claudius, originally came from a short humorous play depicting harvest festivities in a north German village. The poem was later set to music by J. A. P. Schulz, a minor composer born in Berlin who eventually became Capellmeister to the Danish court; it was published in Lieder für Volksschulen (Songs for Elementary Schools) in 1800. From there it passed to England, where it appeared in Jane Campbell’s translation in The Bible Class Magazine in 1854, soon becoming a firm favourite for the distinctively English church festival of Harvest Thanksgiving. The pastoral tone of both words and music reflect the love of nature found in such works of its period as Haydn’s The Seasons. Glory to thee, my God, this night must be numbered among the very finest of English hymns in its inspired combination of simplicity and dignity. The author of its text, Thomas Ken, probably wrote it during the 1670s when he was a Canon of Winchester Cathedral. It was included in his Manual of Prayers for the use of the scholars of Winchester College, together with the morning hymn Awake my soul. The serenely beautiful tune, known as Tallis’s Canon, was first published in Matthew Parker’s English Psalter in the 1560s. Tune and text were wedded in the eighteenth century or possibly earlier. The day thou gavest, Lord, is ended represents (at its best) the formerly much-despised tradition of Victorian hymnody. The composer, C. C. Scholefield, was an amateur—a clergyman who was Chaplain of Eton in the 1880s—yet who could resist his mellifluous and slightly waltz-like melody? And Ellerton’s text, if less than Miltonic, nevertheless painted its images memorably on a global canvas extending as widely as the British Empire itself. The hymn first became popular when it was used at Queen Victoria’s Diamond Jubilee in 1897, and only began to pass away, like earth’s proud empires, when the institution of Anglican Evensong began to fade in the 1960s. The words and music of Eternal God were written in 1999, with the aim of augmenting the meagre stock of hymns which make mention of music, or indeed any of the arts, as gifts of God. The lack of hymns on this theme could be because hymn texts tend to have been written by the clergy, whose relationship over the centuries with the musicians who serve alongside them could charitably be described as wary. Christ is made the sure foundation was composed by Purcell (who ultimately found the theatre more congenial than the Church), as the closing section of his verse-anthem O God, thou art my God where it is set as an Alleluia. It was not wedded to its early medieval text (the second part of Blessed city, heavenly Salem) until the 1939 edition of Hymns Ancient and Modern. The hymns heard on this recording span over fifteen centuries of the history of Christian Europe. They have been chosen not with the aim of representing every possible strand in the rich and complex history of hymnody, but simply to make up a varied programme which can be listened to for pleasure. Some items are accompanied by organ, some by harp where this lighter and more transparent sound seems appropriate; some, notably the ancient and inspiring Gregorian hymns, are left unaccompanied; and five of the grandest hymns are given festival arrangements with brass, timpani, percussion and organ. Every denomination and every country has its own special repertoire of hymns: there are remarkably few which are universally sung throughout Christendom, partly because of the difficulty of making satisfactory translations, partly because every congregation loves the hymns it feels are especially its own. The perspective of this album is Anglican; but the Anglican hymn tradition, since the appearance of Hymns Ancient and Modern in 1861 and that greatest of all hymn-books in English, The English Hymnal of 1906, has been notably eclectic. Gregorian chants rub shoulders with eighteenth-century London street songs, German chorales, Celtic folk melodies and the other prolific outpourings of Trad. and Anon. Medieval Catholic monks bear poetic witness to their faith alongside reformed slave traders, metaphysical poets, evangelical preachers of the time of the Industrial Revolution, and all manner of clergy, high, low and in between. Hymnody is forever changing. This album does not attempt to reflect the most recent changes—the emergence of pop- and folk-influenced worship songs and choruses; this has been well taken care of elsewhere, and time alone will tell whether any words or music of lasting worth have been produced in the wake of this most drastic upheaval of worship style for over a century. Perhaps it is timely to reflect on the immense riches of hymnody built up over so many centuries, and to be reminded of them at a time when they are at risk of neglect.